Passed away peacefully 18th March 2017. Proud father and father-in-law to Thorbjorn & Svetlana, Tim & Melanie and Ashley & Melissa. Loving grandfather of Morgan, Samual, Mischa, Nikita, Edward and Henry. SYDNEY: Police will launch a second special Night Car patrol on the Pacific Highway for one week from today in a bid to prevent accidents on Australia’s notorious road. 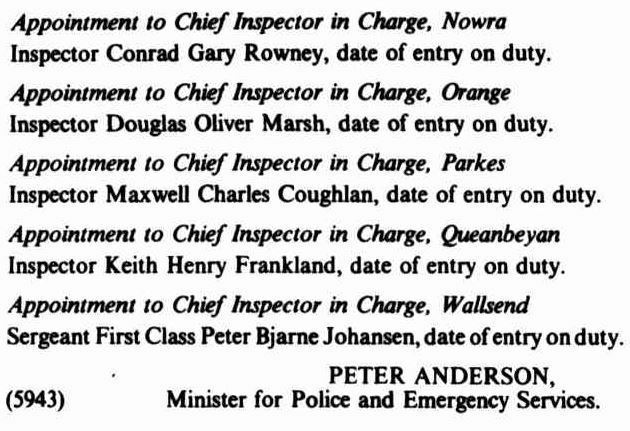 The special patrol coincides with the first anniversary of the Sunliner coach crash at Cowper, near Grafton, in which 22 people died. In a statement issued in Sydney, Chief Inspector Peter Johansen, of Northern Region headquarters, said increased patrols were to continue for the remainder of the year, as statistics gathered over several years had revealed an increase in serious crashes in the September December quarter. The patrol would be on the road between 8.30pm and 4am, covering the area from Hexham, near Newcastle, to the Queensland border. It would complement routine traffic police operations based in all major towns along the route. Chief Inspector Johansen said the Night Car patrols were necessary to maintain a constant high profile for police. The first Night Car operation earlier this year travelled more than 3000km and booked 55 vehicles for exceeding the speed limit. This included 18 coaches, and two heavy vehicles were found travelling at 96 and 110km/h in a 60km/h zone near Coffs Harbour. SYDNEY: The number of fatal accidents on the Pacific Highway at Port Macquarie on the NSW mid-north coast has forced police to increase patrols and start community-awareness programs, a police spokesman said yesterday. Since January, 27 people had been killed in 20 accidents in the area, compared with 18 deaths in the same period last year, operations support commander Chief Inspector Peter Johansen said in a statement. He said a traffic policing system had been adopted from Tasmania using a computer to select random patrol points along the Pacific Highway. “It has the potential to reduce the accident rate by up to 50 per cent,” he said. Chief Inspector Johansen said the system aimed to undermine the security of drivers who thought they knew the “favourite radar spots”. There will be a six-month trial of the new patrolling system by Port Macquarie police and if successful it could be extended to other areas. SYDNEY: Tougher CB radio laws and increased police patrols were foreshadowed yesterday as a means of cutting the number of fatalities on NSW’s notorious Pacific Highway. Senior police have recommended stiffer penalties for truck drivers who use CB radios to warn colleagues of police patrols on the state’s roads. North region commander Chief Inspector Peter Johansen said many truck drivers were using the CBs to undermine police operations, particularly those involving marked car’s. “I imagine the trucking industry has a code of ethics, but I don’t think it’s ethical when they divulge the position of marked cars to other drivers,” Inspector Johansen said. Inspector Johansen said existing resources would be re-examined with a view to assigning more officers to the Lismore and Port Macquarie districts to boost patrols on the Pacific Highway. Northern NSW was the scene of two recent crashes involving tourist coaches which claimed more than 50 lives.